Sky Driving School is a driving school based in Ilford Essex. It is run by Muj and Sophie, two driving instructors with several years experience. The school covers the entire East London area and it has a positive online reputation. The school has both male and female driving instructors, as well as multi-lingual driving lessons too. You can view Sky’s introduction video below. 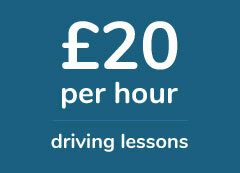 Sky Driving only offer manual driivng lessons and prices begin at £20. Their driving lessons are relatively cheap for the area, although it is possible to find cheaper driving lessons in Ilford. The school’s introductory deal of 4 lessons for £50 is however great value. The introductory deal works out at £12.50 an hour, a significant discount. The deal is only available to new customers, so if you are an existing one, you will have to pay the standard hourly rate. If you would like to block book with the school, it costs £180 for 10 hours with them. You can view the driving school’s recent passes on their website. Here you can see pictures of students who have recently passed, along with their feedback. This section of their website has a large number of pictures and testimonials and it shows the driving school is well thought of. The school also has a number of reviews on 3rd party websites. On Facebook they have a 4.7 out of 5 rating, based on 37 reviews. From the comments left by ex students, Shereen and Shabnam are two of their more popular driving instructors. As well as both being patient and calm, they are also very punctual which is a good sign. Sky also has 9 reviews on Google too. Sky Driving also provide, driving instructor training. If you live in Ilford or the surrounding area, you can train and qualify as a driving instructor with the driving school. Prices start at £30 an hour and for more details, visit the school’s ADI training section. To make an enquiry with the driving school, you can either use the details on this page, or use their contact form. Sky Driving also have a competition where you can win a free driving lesson with them. To enter, you need to complete the traffic signs quiz on their website. I started out very nervous but slowly I got to grips with things with the help of my driving instructor Muj. He's very patient and understanding and never rushes. He made me feel confident right from the start and he's one of the best driving instructors in Ilford. Sky Driving have to be one the best driving schools in East London. Shabnam is a great instructor, she's really easy to understand and I got on well with her. It wasn't easy, I take ages to get the hang of things, but she was right there with me every step of the way. Super punctual and organised as well and this definitely helps. Passed at the third attempt but that's not down to Muj, just that I made silly mistakes. Muj is a good instructor, he's very experienced and friendly too. This would have been a 5 star review, just that he had to rescheduled lessons a couple of times. My instructors name was Shelley and she's was great with me. She's calm and very laid back. I don' remember her panicking at any point during my lessons, even though I did some crazy things looking back on it now! I over her open and friendly personality and I've already recommended her to my friends and family. Happy I passed my test, Sky are a good driving school and my instructors was good too. He knows the Ilford area well, he took me through Goodmayes really early to get me used to the test route and I'm happy with my choice.